Some people and things know better how to gamble and win than to live or be ordinary. That’s the last line in an original short story that Al Klinger read at his 90th birthday party in Hyde Park. But on the afternoon of Sunday, May 15, it was just the beginning. “Who are you?” a friend heckled from his seat in the audience, where he grazed from a plate of catered Mexican food. In Hyde Park, it seems that everyone not only knows Al Klinger, but they also know that he is far from ordinary. At ninety years old, he is spritely, sharp, smiling, and spirited, surrounded by people he loves and who love him right back. 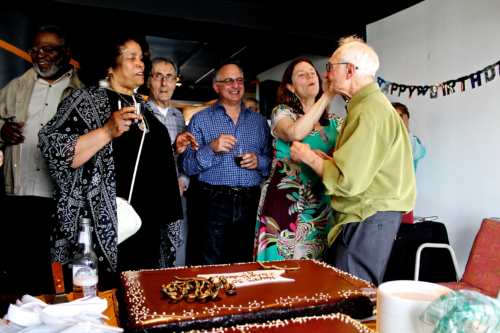 A retired family physician who held a practice on the South Side for decades, Klinger invited the entire neighborhood to his birthday celebration via the Hyde Park Herald. At the party, held in the penthouse of the Regents Park Towers, he gathered with family, friends, and acquaintances who responded to the ad. In lieu of gifts, he asked for donations to the Jane Addams Senior Caucus, a grassroots organization led by Chicagoland senior citizens concerned with economic, social, and racial justice. At the beginning of the party, Klinger stood on a step stool to steal the attention of the crowd and introduce each of his family members by name, ignoring pleas from loved ones to get down. When he was done listing his loved ones, he addressed the remainder of the crowd. “I think it’s very important to know that you—from Hyde Park, South Shore, South Side—have been extremely important to me, wherever I have been, wherever I am going, and wherever I will go,” he said. To kick off the festivities, Klinger, an avid writer, read one of his original short stories. He then launched into the story of his life: Born in 1926—before Charles Lindbergh flew the Spirit of Saint Louis across the Atlantic, he noted—he spent the next decade or so in Chicago’s Lawndale neighborhood with his mother, father, and three siblings. This traumatic experience led him to a realization that would determine the course of his life. “I wanted, essentially, to save the world,” he said. With the help of the G.I. Bill, Klinger entered medical school at the University of Illinois, where he met his wife. He graduated in 1953. They had four children. “At the same time I was trying to become a physician, I was also trying to become more convincing politically,” Klinger said of his early days as an activist. He mentioned the 1955 lynching of fourteen-year-old Emmett Till as a major catalyst for his passion for activism. “I was furious, but I didn’t know what to do,” he said. In June of 1966, he found his way with the civil rights movement when he joined a march in Mississippi led by Martin Luther King Jr. Shortly thereafter, Klinger worked at voter registration offices in Chicago, oftentimes staying past midnight to register people “who didn’t dare go to a polling place because they might lose their lives,” he said. Around the same time, Klinger opened an office in Hyde Park on 53rd Street and Woodlawn Avenue that he would maintain for several decades. At one point in his early career, Klinger was making 200 to 300 house calls a day and seeing firsthand how people in his community lived. “I often [found] in the last week of the month, many of them did not have food in their refrigerators or on their shelves,” he said. Klinger devoted the bulk of his career as a physician and activist to learning the unique needs of Chicago’s South Side and advocating for the wellbeing of his community-at-large. For decades, his op-eds have appeared in the Hyde Park Herald and Chicago Reader—and he continues to use the pen as a weapon. Recently, he wrote about his disapproval of the Obama Library placement on public park property in Hyde Park. Today, alongside fellow members of the Jane Addams Senior Caucus, Klinger continues to advocate for affordable housing, a $15 minimum wage, and retirement security, among other causes. At his 90th birthday party, a DJ was present, as well as a buffet of Mexican food, orange and yellow streamers, and two chocolate cakes. Klinger danced as the DJ spun Stevie Wonder’s “Happy Birthday.” His friend Sergio, who catered the party, helped him slice the cake. As if instinctively, and to the surprise of everyone, Sergio launched the first slice at Klinger’s face, sending the birthday boy into a fit of hysterical laughter. His daughter, Cecilia, came to the rescue with a handkerchief and helped him clean the frosting off of his glasses. A quick scan around the Regents Park penthouse on that particular afternoon would suggest that Al Klinger is quite beloved. His children, grandchildren, cousins, old neighbors, creative writing classmates, fellow activists, longtime friends, and their children were in attendance. At any given moment, if Klinger was not behind the microphone, he could be found in an embrace with a loved one, who showered him with kisses, hand-holds, and whispered well wishes. He’s won the gamble of life. He’s bet on love. 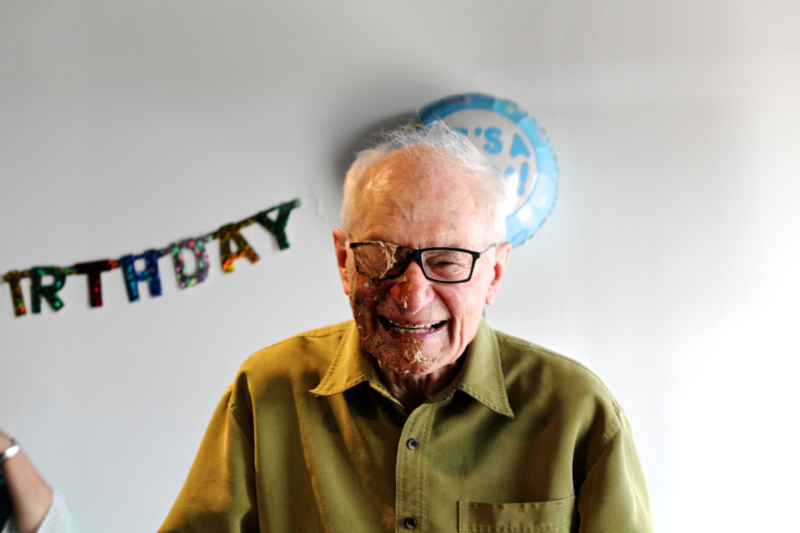 Asked if the party’s various elements—the Mexican food, the orange streamers and balloons, the chocolate cake—were reflections of his favorite things, he said no. Dear Bridget, Thank you for your depiction of my 90th celebration. You definitely caught the essence of it. I am deeply appreciative.